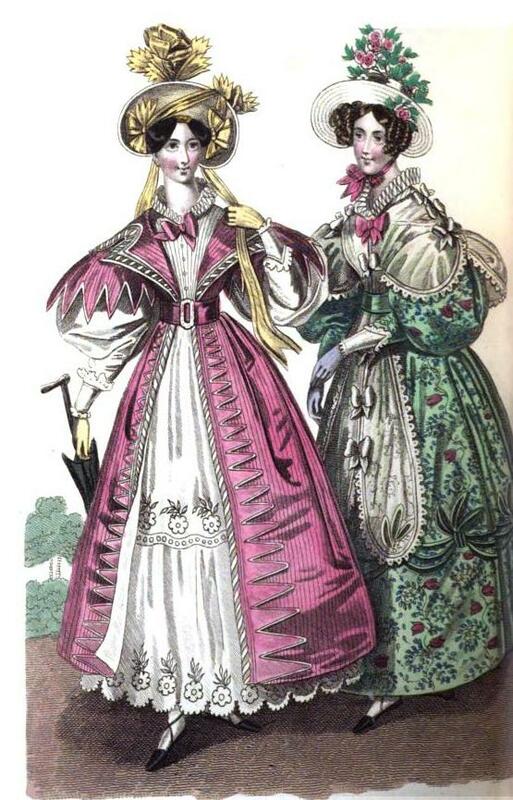 today we’re gonna take a look at what fashionable English women would have worn in the summer of 1832. I have to say I don’t care much for the carriage dresses. There’s just too much going on with them, although the colours are pretty. But the other outfits are simply gorgeous, don’t you agree? 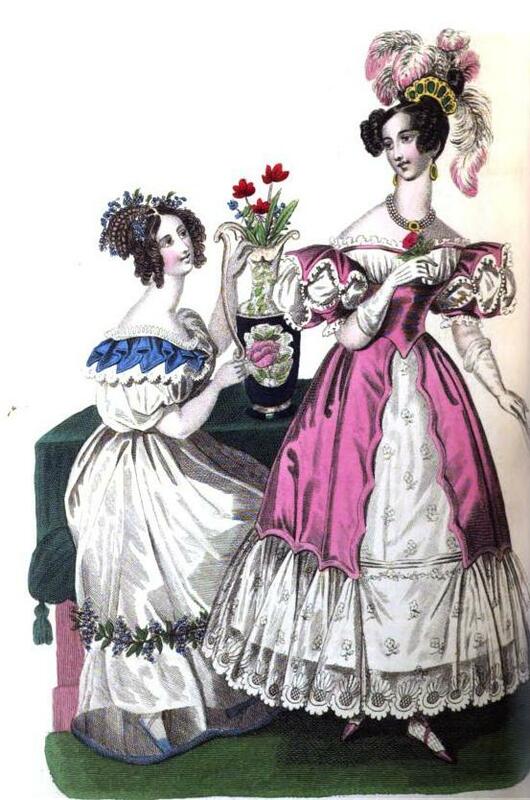 A dress of tulle over white satin, the corsage is a l’ enfant, not very low, and is trimmed round the top with a fall of blonde, over which is placed a fancy pelerine of blue satin, finished by a ruche of tulle; short loose sleeve, that of the slip being carefully plaited and set out. The skirt is finished by abroad hem, surmounted by a wreath of the forget-me-not in artificial flowers. The coiffure of this costume is extremely simple; the hair in front is curled in soft ringlets, while the back part is formed into plaits, intermingled with a wreath of forget-me-not; two small sprigs are also made to mingle with the curls in front. This costume consists of delicate rose-coloured satin and blonde. The robe it very short, and open in front, the edges being cut in inverted scallops, trimmed with a double rouleau of satin, and a deep flounce of blonde finishes the bottom of the skirt. The lower part of the corsage is of satin, pointed in front; the upper part is of blonde, lined with satin, and finished by a pink rouleau, and narrow edge of blonde. 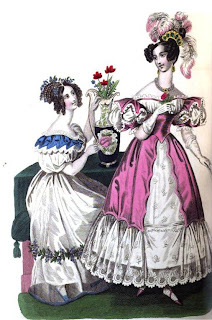 The sleeves consist of two rows of scallops, their points are united by rows of pearl or satin rouleaux, forming openings, through which the sleeve of tulle is visible. The hair is dressed in full boucles crepees, with bows behind, and a plume of pink and white ostrich feathers. A dress of pink striped gros de Naples and jaconot muslin; the corsage of the pelisse fits close to the shape, it is very open in the front, displaying a simple chemisette of cambric. 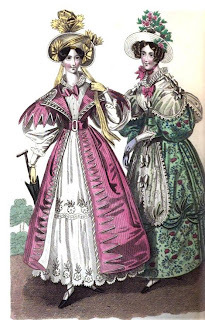 The lapels, which fall back, are divided on the shoulder, square across the back, and are edged by a torsade of pink and white silk, and a white rouleau. The jockey is of the same material as the dress, and falls over the upper part of the full white sleeve in deep points edged with white. The skirt is left very open; it is trimmed down the front with a torsade, a white rouleau, and a row of points, increasing in depth gradually downwards, and should be left short enough to show the bottom of the embroidered flounce of the under dress. Hat of straw-coloured moire, trimmed with gauze ribbon, delicately striped with brown; a bow is placed near the hair on each side, an end of each is brought across the brim, and united on the upper part within an inch of the edge, where they form another bow, a little on one side. The ornament on the crown is of cut ends and bows, imitating a flower with its leaves. A dress of pea-green printed Chaly, corsage half high, sleeves very tight to the elbow and full above, finished at the wrist with a manchette of tulle. The skirt, above the hem, is trimmed with festoons of three rouleaux, gathered together at regular intervals by a strap and three leaves. This trimming is of gros de Naples or satin, and should be a shade or two darker than the dress, or it will not tell from the pattern of the gown. Pelerine of net, edged with blonde and a satin rouleau; it has long, round ends, closed down the front by small bows of white satin ribbon. Three bows are placed on each shoulder. Hat of rice straw, with a chaperon of small roses round the crown. One rose is placed within the brim, just over the curls on the left side. Gloves of flesh-coloured kid – bronze kid slippers, without bows. 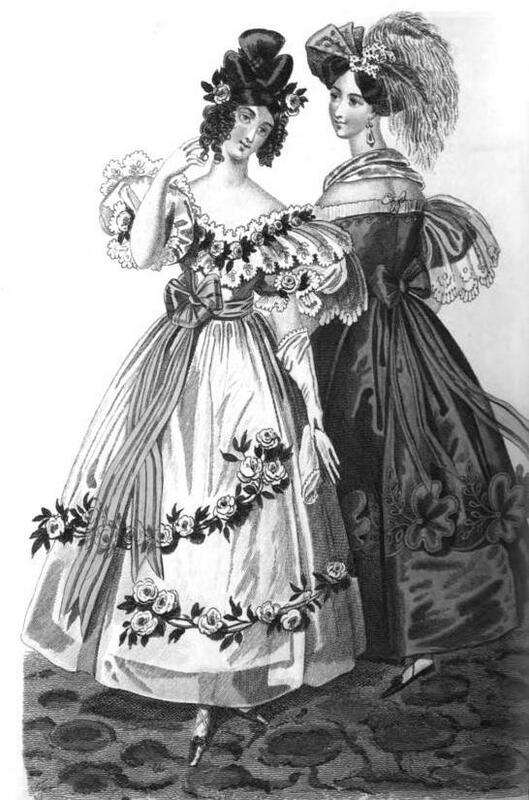 A white crape dress over a white satin slip; the corsage fits close to the shape, and is cut en coeur, very low in front, and is finished with a fall of blonde gathered round the bust by a wreath of small white Provence roses; the sleeves are full and loose; they are trimmed with blonde, and two small roses which are placed close to the arm so as to lift the blonde. A wreath of roses with a bouquet at each end forms the elegant garniture of the skirt; this wreath begins on the right side, at a small distance from the bottom of the hem; and rising gradually as it goes round, terminates on the left side, rather higher than the middle of the skirt. Ceinture of emerald green gauze ribbons, tied on one side with a double rosette and long ends; the hair is dressed in full bows and ringlets; a short wreath goes round the back of the head, and ends among the curls on each side of the face. Gloves and shoes of white satin. This dress is of sapphire blue moire; the corsage close, cut square round the bust, and finished by a chemisette a l’Italienne of blonde. Short beret sleeves, with jockeys of blonde. The skirt is trimmed with a hem en revers, cut in inverted scallops; on the point of each is placed a raised fan-like ornament cut rather wavy, or confined by a silken button, from which issue two sprigs of leaves, embroidered with delicate piping turban of blue gauze, figured in gold, divided in the middle by a magnificent diamond aigrette, from which issue two beautiful drooping white feathers, of the lightest and most airy description. Echarpe of blonde net, embroidered in gold. Black satin shoes.